HILL WAREHOUSE - BLACKWELL'S DURHAM TOBACCO / AMERICAN TOBACCO CO.
Can anyone tell me where the water comes from that runs through the court yard behind the Washington Warehouse ???? Gary, do you know when the fire in 1958 was? i work at american tobacco and we are trying to research it. 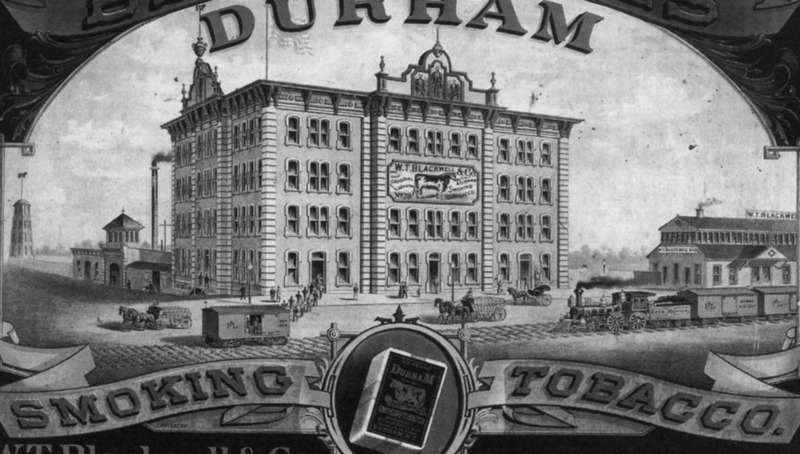 The birth of the tobacco industry in Durham started with a handful of people -none of whom were named Blackwell, Watts, Duke, or Carr - who saw the new 'town' of Durham Station as a place of opportunity. Wright left and began his own business in 1859, and Morris then partnered with Dr. Richard Blacknall - and after several more buyouts by WA Bowles, and WA Ward, Blacknall and Morris' portion were sold to John Ruffin Green in 1864. Green, with more extensive tobacco sales experience, would hit upon two marketing breakthroughs - one through happenstance, and the other through some creative appropriation. The first was the encampment of Confederate and Union troops at Durham Station at the end of the Civil War. Confederate General Joseph E. Johnson, whose troops were encamped at Hillsborough, and Union general William T. Sherman, fresh from torching Atlanta and electing not to torch Savannah, was encamped in Raleigh. They agreed to meet at a midway point on the road from Hillsborough to Raleigh -the farm of James Bennitt - to negotiate surrender of the Confederate army. While encamped at Durham Station, both sides availed themselves quite liberally of John Green's tobacco supply without recompense. While Green was distraught at the loss of his tobacco, when those same troops wrote to Green weeks and months later to order the Bright Leaf tobacco, he had successfully managed to hook a large and geographically diverse audience on his product. The second was a discussion with his friend JY Whitted, who suggested that Green should make use of the bull used by the Coleman Mustard Company on their "Durham Mustard" containers. Although it's repeated in several sources that Whitted and Green chose the logo because they erroneously thought Coleman's was located in Durham, England, this seems unlikely. 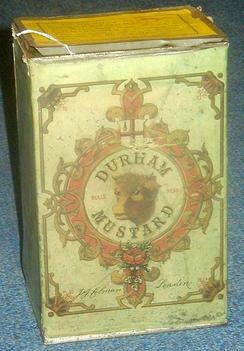 The name "Durham Mustard" had come to denote a variety of mustard, and was thus printed on containers as above, regardless of location of manufacture. Green registered the trademark in 1866, along with the name "Genuine Durham Smoking Tobacco." He mounted a sign on the front of his factory depicting the bull. 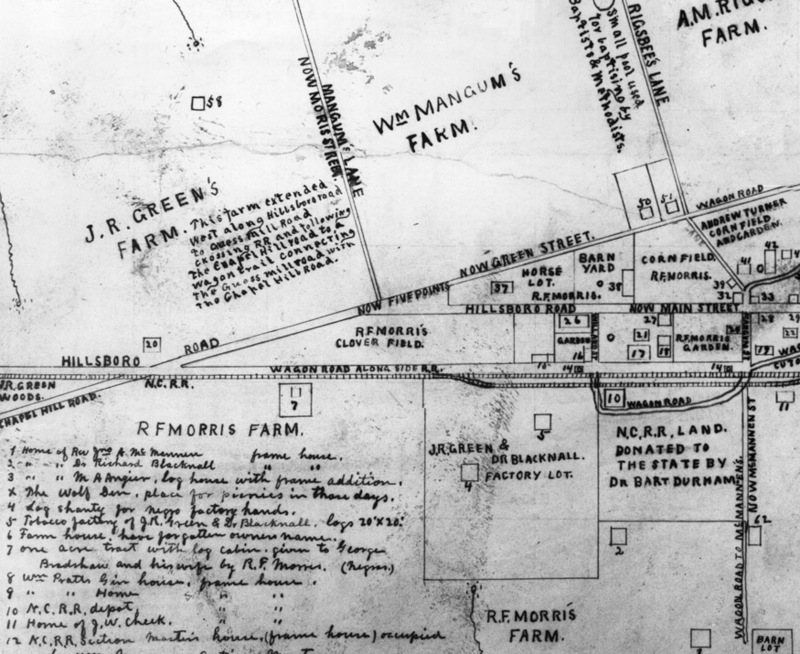 Lewis Blount's 1867 map of Durham - the best way to orient yourself might be to find the railroad line and the spot that it says "Now Five Points." Main St. does not extend west of Five Points. #5 is the Green tobacco factory, and #10 is the railroad depot. During this same period, William T. Blackwell and James R. Day were building a tobacco sales business, and had established a tobacco jobbing house (a kind of distribution center that would buy tobacco from many different manufacturers to sell to retailers) in Kinston, NC. They were customers of Green, and when Green's health began to fail in 1868, they joined his business, which was changed to JR Green and Company. Green, despite attempted salutary trips to Catawba Springs, was unable to regain his health and died in 1869 at age 37. Blackwell purchased the remaining half-interest in the factory, including the trademark, at an estate auction for $2292 in 1870; he then renamed the company the WT Blackwell Company, although JR Day remained a partner in the business. Business was booming, and Blackwell needed additional capital to meet demand. Later that same year, he sold a 1/3 interest in the company to a 25 year old man from Chapel Hill - a UNC graduate and former Private in the Confederate army - named Julian (Shakespeare) Carr. This new capital allowed the partners to begin construction of a factory which would match their growth and ambition; this factory building (which would later be known as "Old Bull") was completed in 1874, the same year that Washington Duke moved to Durham, and 4 years before the W. Duke & Sons Tobacco Co. was established. This L-shaped masonry Italianate structure was a revelation in 1870s Durham - which, the second drawing reveals, was a place of predeominantly small frame structures and muddy streets; it's hard to overstate what a bold structure this was in context; the first brick tobacco factory in the US, located in a tiny train depot town. The factory had a loud factory whistle which was purported to sound like a bull, and a large bell in a bell tower that rang on the hour. The other revolutionary facet of the Blackwell Company's business was the extensive use of national, and international, advertising, such that the Bull appeared, seemingly, everywhere (including, purportedly, a sign on one or more Egyptian pyramids.) The company helped promulgate the notion of an iconic American brand promoted through advertising. By 1878, Blackwell and Carr bought out JR Day, who seemed to do well enough to later build a rather sumputous house at Roxboro and Main. For their part, Blackwell built a fine house nearby at present-day West Chapel Hill and S. Duke Sts. and Carr a series of estates on the east side of downtown. By 1879, business had continued to grow to the extent that the original factory warranted expansion, and another "L" was added to the original, extending the Railroad St. (now Pettigrew St.) facade to the west, and that new northwest corner to the south. This formed a U-shaped factory. In the early 1890s, a power plant was constructed on Second (Blackwell) Street, off the southeast corner of the factory building. Old Bull with power plant behind it, 1895. A wider view - a lot of details differ here, and I wonder if a bit of artistic license was involved. In 1898, the Union Tobacco Company, which appears to have begun as a vehicle for financiers from New York and Philadelphia to acquire other companies, purchased the Blackwell company through the acquisition of the $4 million in company stock. In 1899, Union acquired a controlling interest in the Liggett & Myers Company of St. Louis. James B. Duke, intending to monopolize the tobacco industry, formed a subsidiary of his American Tobacco Company - the Continental Tobacco Company. This subsidiary purchased Union (including Blackwell's) and Liggett and Myers. By 1901, Duke merged Continental and American to form the Consolidated Tobacco Company. Thus began a rapid expansion of brick structures at the old Blackwell plant - in 1902, the horseshoe shape of the Old Bull Factory was enclosed by another wing on the south side, forming a 'box' shape. The Hill warehouses were built immediately to the west of Old Bull in 1902 as well. The Cigarette Building (later known as Lucky Strike) was built just to the south of the power plant in 1903, and the Reed Building just to the south of it in 1902. The Burch warehouse, oriented East-West, was built to the south of Reed sometime before 1913. The long series of warehouses along Carr St. (on the west side of the property) known as the Washington building was built from 1904-1905. It had 12 bays, excepting Bay 5, which was missing to allow for a drive from Carr St.
Old Bull, the power plant, Lucky Strike, Reed and Hill - looking southwest, 1905. The Noell building, just to the west of Lucky Strike, was added in 1906. Looking southwest and down Blackwell St., 1906. "The Trust" as the Consolidated/American Tobacco company was called, engendered more resentment and distrust after the economic crisis of 1907 - a suit was filed against the company that same year for violation of the Sherman anti-trust act. A series of litigations occurred over the next 4 years, finally resulting in the Supreme Court-ordered dissolution of the trust in May 1911. The American Tobacco company was divided in 14 companies. Liggett and Myers returned to its home base of St. Louis, but with control of the former W. Duke and Sons Factory on West Main St. The former Blackwell plant became known as the (reorganized) Durham Branch of the American Tobacco Company under the leadership of Percival Hill. The company restarted the "Bull Durham" advertising campaign, putting signs in the outfield of baseball stadiums with an offer of $50 to any baseball player who hit the Bull. Campus in 1913 - north is to the right. Bull Durham smoking tobacco was the most popular brand in the country, and its stature only increased during World War I, when it was included in the rations given to soldiers on the front lines, and in 1918 production was temporarily taken over by the US government to exclusively supply soldiers with tobacco. Bull Durham tobacco, to be clear, was not produced as cigarettes - cigarettes were "roll your own." Tobacco was placed in cotton bags manufactured and strung at the Golden Belt Hosiery Mill, which Carr formed in 1887 for the particular purpose of manufacturing tobacco bags. Golden Belt was originally located in the original wing of the Old Bull Building before outgrowing the space and moving to the old Whitted factory in 1899 (now Venable) and to its own factory in Edgemont in 1901. These bags were typically tagged by home workers (a true 'cottage industry'). Women and children in particular would tag thousands of bags, often on their front porches. By the 1920s, Bay 5 of the Washington warehouse had been filled in, making the Washington building a continuous series of bays. Looking east, 1920s. From left to right: Hill, Old Bull, Washington (foreground), Old power plant, Noell, Lucky Strike, Reed. Looking southwest, 1920s, at Old Bull, the Hill Warehouse, the old power plant, Lucky Strike, and Reed. The 1920s brought new challenges to the company, as ready-made cigarettes became increasingly popular. The company tried to go head-to-head with cigarettes, but was fighting a losing battle. The company shifted to ready-made cigarette production, but its iconic brand had lost momentum, and sales suffered. However, Lucky Strike did become an increasingly popular cigarette, and Percival Hill's son George Washington Hill, emphasized the brand after taking over the company in 1925. The relatively better position of Durham in the great Depression was exemplified by the increases in employment and sales at the American Tobacco in 1930. The company slashed prices of Bull Durham (bag) tobacco, and the brand saw a resurgence in sales. The company employed 3500 people in 1931, and produced 1.75 million cigarettes and 1.5 million pounds of smoking tobacco a month. In 1930, the company constructed a new power plant, and the iconic Lucky Strike smokestack and water tower. 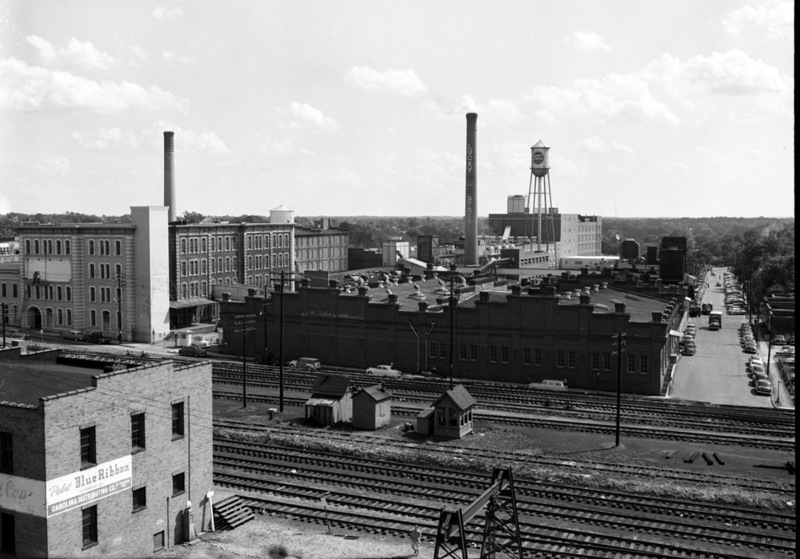 Looking northwest at the factory from near Morehead Ave. and Blackwell, early 1930s. The Washington warehouses are on the left, and the Burch warehouse straight ahead on the right. It was around this same time that the original wing of the Old Bull Building was 'decapitated' and reduced from 4 stories to 2. I'm still not sure what the real reason for this was - I've heard a variety of explanations. Fire insurance, fires, utility costs, architectural style - I don't know the real reason. Looking north from near Morehead through the middle of the complex, 1937. The Washington warehouses are on the left, Burch, and beyond it, Reed on the right. Looking up Blackwell from Morehead, 1937. Looking north from Morehead up Carr St., 1937. Looking west down Vivian St. at the old power plant and the east side of Old Bull. Looking north up Carr St. alongside the Hill Warehouse, 1937. Looking northwest from Blackwell St. at the Reed building, 1937. In 1939, American Tobacco built the large Fowler Building at the southeast end of the campus (Blackwell and Morehead). In 1946, the Burch warehouse was torn down, and the Strickland Building was built just to the south of the Reed Building (George W. Kane was the general contractor,) and in 1955, the Crowe Building joined Strickland with Fowler. Looking up the center of the campus, 1955, with Fowler in the foreground and Crowe under construction just beyond. Looking northwest up Blackwell at the Crowe Building under construction, 1955. Strickland is to its right. Two pair of additional warehouses were built to the south of the complex, across Morehead, and to the west of the complex, on Portland Avenue. Aerial view from the south, looking north, 1950s. Map of the campus, 1950. north is to the right. Looking southeast down Carr St. and at the full complex, late 1950s. Shift change on Carr St., 1950s. By the late 1950s, the old power plant / machine shop / smokestack, to the south of Old Bull were demolished. In 1957, the last of the Bull Durham smoking tobacco production was moved from Durham to Richmond, and the Durham plant became exclusively a cigarette manufacturer. The complex in 1959, annotated with buildings and dates - north is to the right. A view of the company on a company postcard, 1967. You can see the cleared urban renewal areas in the background, mostly covered by giant cigarette packs. Cigarette production persisted into the 1980s, while continuing to decline throughout the 1960s and 1970s with decreases in smoking post-surgeon general's warning. In 1987, the American Tobacco Company shut down operations in Durham and moved all remaining production to their plant in Reidsville. Thus ensued a series of proposals to redevelop the plant into something else. The complex was bought by J. Adam Abram / ABD Associates, who intended to redevelop the campus. The success of the Durham Bulls under Miles Wolff, particularly post-"Bull Durham", coupled with the deteriorating condition of the DAP led to plans for a new ballpark, located on the University Ford site. But the primary motivation was that Jim Goodman was in talks with Wolff to purchase the Bulls - and wanted to move them to "Triangle Central Park," located mostly in Wake County. In 1989, the city responded by promising Wolff a ballpark downtown, along with a sizable private investmen - GSK planned a move downtown, ADF and the Museum of Life and Science all would be part of the the new ballpark/ complex. ABD associates planned to commence their American Tobacco renovation as part of the development. The plan was approved by the city council, but rejected by the county, on the premise that it needed to be put to a vote. When the vote failed in 1990 (with some strong editorializing against it by Jim Goodman), Abram abandoned plans to redevelop the complex, but retained ownership. The city, as many know, wisely ignored the voters and built the ballpark on the east side of American Tobacco, rather than the west. Fortunately Wake County began to question paying for "Triangle Central Park", and Durham retained the (then Goodman-owned) Bulls. The DBAP was completed in 1995. The American Tobacco Complex had sat idle during this time, but after the construction of the ballpark, a couple of former Duke basketball players who called themselves "Blue Devil Ventures" became interested in redeveloping the site. They acquired an option to purchase the site from Abram for $6.6 million. They attempted to obtain $50 million in investment to renovate the property, but could not put together a package. Their option expired, and they moved on to develop West Village in 1998. The renovation of the campus was planned in two phases - with the southern ~2/3 of the campus first, accompanied by the city and county parking decks. The campus would include a central pedestrian-focused area as the nexus of activity with a 'river' coursing along the former rail passage through the center of the campus. The first tenant, Glaxo, moved in by June 2004; work continued throughout the remainder of 2004 and 2005 to complete the first phase, which included corporate tenants, 4 restaurants, and that imprimatur of corporate acceptability, a Starbucks. In June 2005, Capitol announced that it would partner with Streuver Brothers, Eccles, and Rousse - of Baltimore, to build Phase II - the northern and older portion of the property. That work has been underway for some time, with construction finally wrapping up on the last renovated, and oldest, building on the campus - the Old Bull Building. One of the most exciting events of the early construction was the removal of the pink metal facade from the Old Bull Building. [The history section of this post relies heavily upon the excellent little book Bull Durham Business Bonanza by Ben and Snow Roberts. Gary, do you know when the fire in 1958 was?